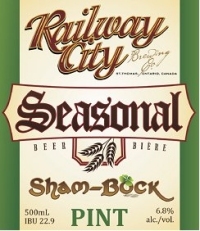 ST. THOMAS, ON – Today is the launch day for Railway City Sham-Bock, the newest seasonal beer from Railway City Brewing. Notes of dark fruits raisins and figs, molasses and dark maple syrup. Plum and toffee are foremost with a hint of chocolate. True to the Doppelbock style, Sham-Bock is a little sweet, higher alcohol with a minimal hop profile. Like a good lager, Sham-Bock is very drinkable, impeccably clean and crisp in finish. Railway City Sham-Bock is a limited release of 1200 bottles (500 ml) and limited kegs, and will be available exclusively at the brewery retail store and selected bars and restaurants. Brewery tours and samples are being offered today to mark the release, and it will also be the featured beer at tonight’s installment of Railway City’s monthly Thursday Night Sessions event. Last time I checked, a pint was 568 ml, 20 Oz, not 500 ml or a metric “pint”. An Imperial pint is 568ml, And we in Canada are no longer on the imperial system for the last 40 years so there really is no Canadian Pint. You’ll find that American restaurants up here will give you an American pint 473.2 ml if you ask for a pint of beer. So a pint ends up meaning the big glass not the little glass of beer.